There are lots of situations where you might want to disclose a creative piece of work to someone else. You may be at concept stage and want ideas or help in developing it, or you may have developed it fully, but want to manufacture, sell or use it. The other party (whether a business or individual) to whom you divulge may be in a situation to be able to benefit from the using the information (perhaps in direct competition against you) or the passing of it on to someone else. 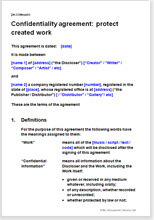 You can use this confidentiality agreement to prevent them from copying your ideas or acting on the information and thus you can protect your personal or business information or ideas. This agreement is about how sensitive information will be kept confidential. The actual nature and subject of the information is not important to agreement of how it will be used. Therefore, there are many situations in which this document can be used. Of course total secrecy is best. But there are many occasions in life when disclosure is necessary. The information protected by this confidentiality agreement could be anything: physical or conceptual, developed or undeveloped, business or personal. This document is drawn broadly to cover all information passing to the other party, but in a way that enables you to insert your own precise secrets if you want to specify them. You should recognise that all the legal agreements in the world cannot prevent accidental or unintentional disclosure (for example, careless talk over a drink with a friend, or when leaving your documents out for public rubbish collection). A good confidentiality agreement (like this one) should therefore also cover what happens if the information is used or disclosed.